골다 메이어는 1898년에 태어났습니다. 그녀는 러시아 핀스크의 척박한 환경에서 자랐습니다. 그녀의 가족은 자유와 번영의 삶을 찾아 1906년에 미국으로 이민을 했습니다. 미국에 있던 시간에 그녀는 정치적으로 활발한 언니 친구들의 영향을 받았습니다. 그들이 종종 토론하던 한 주제는 시온주의였고, 이것이 골다 메이어 마음속에 언젠가는 팔레스타인으로 이주하리라는 깊은 소원을 일깨웠습니다. 팔레스타인에서 다른 유대인 선구자들 대열에 동참하고 싶었던 그녀의 꿈은 1921년에 그녀와 남편이 미국의 안락함을 뒤로 하고 떠나오면서 이루어졌습니다. 배를 타고 대양을 건너와 기차를 타고 텔아비브에 도착하기까지 한 달이 넘는 여정은 정말이지 악몽이었습니다(52-55쪽). 그녀가 처음 본 텔아비브를 오늘날의 텔아비브와 비교하면 인내와 발전의 어마어마한 기적을 말하지 않을 수 없습니다. 그들은 제즈르엘 골짜기에 있는 키부츠에 들어가 참기 힘든 조건 속에서 밤낮으로 땅을 일구었습니다. 그녀의 남편의 건강이 급격히 나빠져 3년 후에 그들은 어쩔 수 없이 떠나야 했습니다. 그 당시에 그녀의 정치적 연줄이 넓어졌습니다. 그들이 예루살렘에서 자녀를 키우기 시작하면서, 골다 메이어는 집에 남아 있는 것에 갈등이 있었습니다. 그녀가 가지고 있는 유대인들의 팔레스타인 정착에 대한 열정 때문에, 그녀는 건국 이전 유대인 정부에서 여러 가지 리더십 역할을 맡았습니다. 그녀의 책임 있는 지위 때문에 그녀는 그녀의 결혼과 가정생활에 큰 무리를 주는 여행을 종종 해야만 했습니다. 그녀는 그녀의 결혼생활이 식은 것은 그녀가 가족과 충분히 시간을 보내지 못한 것 때문이라는 것을 인정합니다. 1934년 경 그녀는 건국 이전 정부의 핵심 리더십 팀에 오릅니다. 그들이 계속해서 맞닥뜨리는 도전들은 어마어마했습니다. 히틀러는 유럽에서 유대인들을 학살하고 있었습니다. 영국 정부는 안전한 곳을 찾아 팔레스타인으로 달아나온 유럽 유대인들의 이민을 강제로 막고 있었습니다. 유대인들에 대한 아랍의 공격은 영국이 그들을 저지하기 위해 거의 아무 것도 하지 않자 팔레스타인 전역에서 점점 빈번해지고 있었습니다. 그들은 공식적인 전투훈련도 없었고 자신들을 방어하기 위해 자신들의 군대를 일으킬 자금도 없었습니다. 벤 구리온과 골다 메이어와 다른 정부 지도자들은 더 이상 점령 세력에 의해 자신들의 미래가 결정되게 놔둘 수 없다고 굳게 동의했습니다. 그들은 자기들의 독립국가 수립을 위해 그들이 가진 모든 것으로 싸워야 했습니다. 골다 메이어는 무신론자였지만, 분명 하나님의 손이 그녀 위에 있었습니다. 그녀와 다른 지도자들은, 그들이 나라를 선포하면 중동의 주변 아랍국들로부터의 거대한 공격이 있을 것을 알았습니다. 그들은 자신들을 방어하기 위한 무기를 구입하기 위해 긴급히 수백만 달러를 모금해야 했습니다. 투표로 골다 메이어가 유대인 공동체에서 모금하기 위해 1948년 초에 미국으로 가기로 뽑혔습니다. 그들은 800만 달러 이상 모금할 수 있을까 의심했습니다. 그러나 기적같이, 골다 메이어는 단 6주 만에 5,500만 달러를 모금할 수 있었습니다! 미국 유대인들은 그녀가 팔레스타인의 급박한 상황을 말하자 울었고 많은 이들이 돈을 보태기 위해 빚을 내기도 했습니다. 이스라엘이 독립을 선포한 다음 날 이웃 아랍국들은 그들이 그러지 않을까 의심한 대로 이스라엘을 공격했습니다. 이스라엘은 그 공격을 저지했을 뿐만 아니라, 반격하여 적을 무찌르기까지 했습니다. 마지막 때에 대한 성경 말씀에 따라, 저는 예슈아께서 지상에 그분의 나라를 세우시러 다시 오시기 전에 다시 이 패턴이 반복되는 것을 봅니다. 하나님의 나라가 지상에 “하루에 생기기” 전, 즉 주님께서 다시 오시는 날에 앞서, 전례 없는 압박과 도전이 있을 것입니다. 이것은 이스라엘에 그럴 것이며, 예슈아의 참된 제자들에게 그럴 것입니다. 사탄은 분을 낼 것입니다(계 12:12-17). 적그리스도가 많은 성도를 이길 것입니다(계 13:7). 미혹과 불법이 성할 것입니다(마 24장). 그래도 메시아의 몸은 시대의 징조를 알 것입니다. 골다 메이어 시대에 나라의 탄생을 준비한 건국 이전 지도자들처럼 메시아의 몸은 예슈아의 재림과 “전 지구를 인수”하기 위한 길을 준비하기 위해 가능한 모든 것을 하는 일에 집중할 것입니다. 요한복음 17장에서 예슈아께서 기도하신 하나 됨이 보이고 느껴질 것입니다. 키부츠처럼, 돈과 소유를 전례 없이 사심 없게 나눌 것입니다(행 2:44-45). 어둠이 땅을 덮을 때조차 나라들의 부가 이스라엘로 올 것입니다(사 60장). 일단의 사람들이 세례요한처럼 자신들을 준비시킬 것입니다(눅 1:16-17, 80). 예슈아의 순결한 신부가 그분과 함께 나라들을 다스릴 자리를 취하기 위해 훈련되고 준비될 것입니다(계 20장). 사랑 가운데 자라고 앞으로 올 것에 대비하여 우리 자신과 다른 이들을 준비시키기 위해 지금 우리가 할 수 있는 모든 것을 하는 데 집중하도록 합시다. 저희 번역 팀에 함께 참여해 주세요! 여러분의 언어로 저희와 함께 여러분의 동족에게 영향을 주고 싶으신가요? 여기 동영상을 보시고 더 자세히 알아보시기 바랍니다! Golda was born in 1898. She grew up in harsh conditions in Pinsk, Russia. In 1906 her family immigrated to America in search of freedom and a prosperous life. During her time in America she was influenced by her older sister's politically active friends. One topic they often discussed was Zionism, which awakened a deep desire in Golda to one day move to Palestine. Her dream of joining other Jewish pioneers in Palestine came true in 1921 when she and her husband left the comforts of America behind. Her account of crossing the ocean by boat, and arriving into Tel Aviv by train over a month later is an absolute nightmare (pg. 52-55). The Tel Aviv she first set eyes on compared to the Tel Aviv of today point to one massive miracle of perseverance and development. They joined a Kibbutz in the Jezreel valley and worked the land day and night in unbearable conditions. Her husband's health deteriorated so quickly that after three years they were forced to leave. During this time, her political connections expanded. As they began to raise children in Jerusalem, Golda struggled to stay home. Because of her zeal for the settlement of Jews in Palestine, she was given numerous leadership roles in the pre-state Jewish government. Her responsibilities required her to travel often which put great strain on her marriage and family life. She admits that the cooling of her marriage was due to her not being around enough. By 1934 she had moved her way up into the core leadership team of the pre-state government. The challenges they continually faced were overwhelming. Hitler was murdering Jews in Europe. The British government was forcefully opposing immigration of European Jews fleeing to Palestine for safety. Arab aggression against Jews was increasing across Palestine with the British doing very little to stop them. They had no formal combat training and no funds to adequately construct their own army in order to defend themselves. Ben Gurion, Golda and the rest of the leaders of the government firmly agreed that they could no longer let their future be determined by occupying powers. They needed to fight with all they had for the establishing of their own independent state. Golda was an atheist, but clearly God's hand was upon her. She and the other leaders discerned that a great attack from the surrounding Arabs in the Middle East would come when they declared statehood. They urgently needed to raise millions of dollars in order to purchase arms to defend themselves. 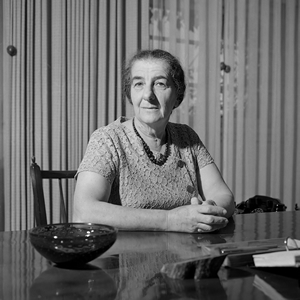 By a vote, Golda was chosen to travel to America in early 1948 to raise funds from the Jewish community. They doubted they could raise more than 8 million dollars. But miraculously, in just six weeks, Golda managed to raise 55 million dollars! The American Jews wept as she described the urgent situation in Palestine and many even took out loans in order to give. The day following the Israeli declaration of independence, the neighboring Arab countries attacked Israel as they had suspected. Not only did Israel manage to stop the assault, but went on the offence and defeated those armies. According to end time scriptures, I see this pattern repeating again before Yeshua returns to establish His kingdom on earth. Unprecedented pressures and challenges will come before the kingdom of God on earth will be “born in a day,” the day of His return. This will be so for Israel and true followers of Yeshua. Satan will rage (Rev 12:12-17). The anti-Christ will overcome many saints (Rev 13:7). Deception and lawlessness will abound (Matt 24). Yet the body of Messiah will know the signs of the times. Like the prestate leaders in Golda's day preparing for the birth of the nation, the body of Messiah will be fixated on doing everything possible to prepare the way for Yeshua's return and “global take over.” The unity Yeshua prayed for in John 17 will be seen and felt. Like the kibbutzim, Finances and possessions will be shared in unprecedented selflessness (Acts 2:44-45). Even when darkness covers the earth the wealth of the nations will come to Israel (Is 60). A people will have prepared themselves like John the Baptist (Luke 1:16-17, 80). The purified bride of Yeshua will be trained and ready to take her place ruling the nations with Him (Rev 20). Let's stay focused on growing in love and doing all we can now to get ourselves and other ready for what's coming! What to impact your own people in your language together with us? Watch to learn more HERE!